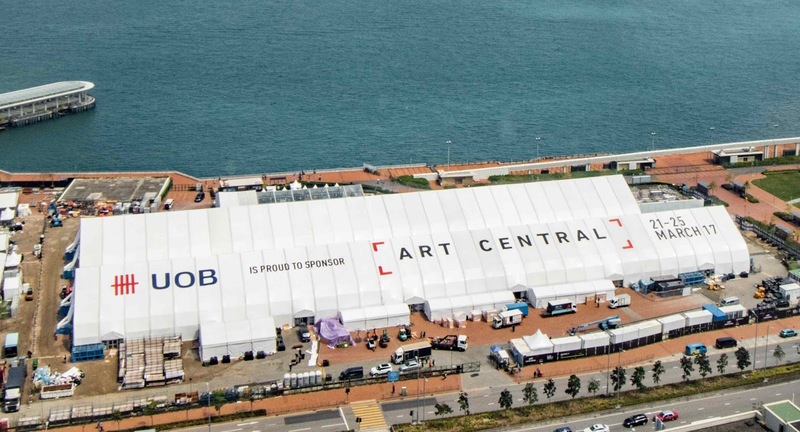 HONG KONG - Art Central, in partnership with United Overseas Bank (UOB), launched the Fair’s third edition today. 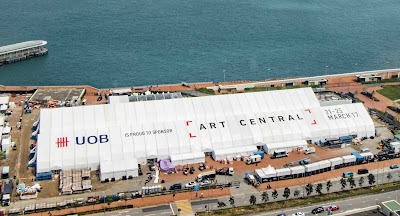 Staged in a custom-designed 10,000 sqm structure on the Central Harbourfront, Hong Kong from Tuesday, 21 March to Saturday, 25 March, Art Central welcomes over 100 international galleries, 75% of which hail from the Asia-Pacific region, bringing together the world’s most exciting emerging and established contemporary artists. (Left to right) Mr. Jims Lam Chi Hang, Curator, PROJECTS; Ms. Linda C.H. Lai, Curator, MEDIA X MUMM, Ms. Mikala Tai, 4A Centre for Contemporary Asian Art; Ms. Christine Ip, Chief Executive Officer – Greater China, UOB; Mr. Charles Ross, Managing Director, Art Central; and Tim Etchells, Co-founder, Art Central, presented the highlight programmes of Art Central during the press conference. Unique to Art Central is a dedicated performance programme. Presented in partnership with 4A Centre for Contemporary Asian Art, Sydney, this features a series of immersive performances by leading international artists. Anida Yoeu Ali, Enoch Cheng, Tobias Gutmann, Uji Handoko Eko Saputro aka Hahan and Amrita Hepi, encourage audiences to reconsider familiar objects and situations, inviting speculation on a spectacle. Performances range from community auction, portrait drawing, protest acts and an 8-hour durational special choreography inspired by activities at the Fair. “Art Central continues to re-invent itself and challenge the conventional art fair format by including unprecedented elements, such as performance art, in its core programme. The groundbreaking collaboration with Art Central is sure to pave the way for artistic innovation in the region while diversifying the market,” says Mikala Tai, 4A Centre for Contemporary Asian Art. Art Central presents a series of site-specific, large-scale installations as part of its PROJECTS sector, curated by emerging Hong Kong curator Jims Lam Chi Hang. The selection features progressive artists Simon Pericich, Tang Jie, Hannah Quinlivan, Santi Wangchuan, Glen Hayward and a rare opportunity to view the latest creation of China’s Political Pop master Yu Youhan. “Inviting Hong Kong curators to the Fair is a meaningful opportunity to incorporate local critical perspective on contemporary art developments in the city. The collaborations serve to contextualize the Fair, making it socially and creatively relevant to the community,” expresses Jims Lam Chi Hang, Curator, PROJECTS. Offering critical discourse at the Fair, Art Central partners with Asia Society Hong Kong Center to present a series of talks that examines contemporary art, its socio-political implications and impact on the cultural development of the Asia-Pacific region. Speakers include prominent international artists Rashid Rana, Hiroshi Sugimoto, Kimsooja and Hon Chi Fun, leading museum directors, curators, art publishers and performance artists participating at the Fair. Through a series of partnerships with UOB, Swarovski, Mumm Champagne, initial, Nike and Ovolo Group, the Fair presents programmes catered to a diverse demographic; including art workshops for less privileged children (UOB), an interactive sound installation (Swarovksi), MEDIA X MUMM (Mumm Champagne), a moving image sector featuring 16mm film projects and experimental motion video works, and DEEP WATER by Hong Kong artist collective Zheng Mahler (YCC), a speculative ‘time-machine’ allowing the audience to experience the natural and political history of Sham Shui Po via Virtual Reality and anaglyphic 3D prints viewed through 3D glasses. “Video works particularly resonate with Hong Kong’s strong film industry history. While the medium of moving image is still in the nascent stages of development, in terms of public understanding and appreciation, a curated selection at Art Central facilitates a coherent and widened introduction to the medium for the wider community,” says Linda C.H. Lai, Curator, MEDIA X MUMM. The multi-sensory experience of Art Central extends to the delectable F&B offerings at the Fair. Headlined by a custom-created pop-up French bistro Le Marché by Michelin-starred Chef Philippe Orrcio, Street Food Central concurrently presents a tantalising line-up including acclaimed Aloha, Bread and Beast, Brickhouse, Beef & Liberty, Mrs. Pound, Teakha all complemented by a Fernet Hunter Bar and live jazz.